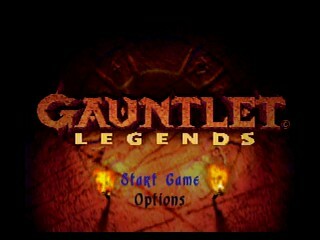 Released in 1998 by Atari Games, Gauntlet Legends is an arcade game later ported to home consoles and the sequel to Gauntlet 2. Gameplay is largely similar, with you choosing one of four possible classes, though the existance of passwords and saving characters is very uncharacteristic of an arcade game. Best time as Archer on Expert difficulty: Single-segment 1:10:19 by 'Boyo003' on 2014-11-11. My name is Ian Boyle, otherwise known as Boyo003. This is my Gauntlet Legends Single Segment run on the Nintendo 64. The story for Gauntlet Legends goes like this. An evil mage used the power of the runestones to summon a demon named Skorne. Skorne broke free of the mage's control, scattered the runestones across the 5 realms, and sealed the realms off. Summoner, the yellow mage in the center of the tower in the game, called upon the heroes to recover the runstones and defeat Skorne. Two things to mention before I start on the run itself. There are 3 difficulties in this game; Normal, Advanced, and Expert. This run is on Expert which seems like more than it really is. The only difference between each difficulty is health. Normal starts you out at 500 health whereas Expert starts you out at 300 health. This is why I decided not to mention it in the title of the video. I choose the archer because her start speed is better then any other character. Now onto the run itself. The first two levels are a set up for a glitch I use in the third. Along the way I hit stone towers that are called Obelisks. They are necessary to open up the other realms. The items I pick up are needed to sell in order to buy an item called Time Stop. I also purchase extra speed; an item that I will come back for again and again in this run. Here is a fun glitch that you may overlook. When I hit a cut scene and Summoner is placing a runestone or opening a new realm; I can control the character even though I am not suppose to. If I hold the control stick in any position when going into those cut scenes I can maintain control of the character. The controls are inverted during the cut scene however. This glitch was brought to my attention by a gentlemen named Xatmamume. No that isn't his real name but if you look him up on either Twitch or Speed Runs Live your sure to find him. I use this glitch to get to the shop menu faster, which I use frequently in this run. At the third level, The Cliffs of Desolation, I perform the biggest glitch in this run. It is called "Prolonged Time Stop". How it works is when my character dies with the item Time Stop on, if I continue the game the enemies are frozen in time. No minions will spawn out of generators; archers, bombers, and suicide bombers will not move. Main boss battles, including the Skorne battles, will still work as normal. The reason to do this is simple. Navigating through each level is much easier when there are no minions to fight through. This also helps the focus of gold onto items needed for boss battles and extra speed to move quickly through each level. This glitch works for the rest of the game, so long as I don't turn Time Stop back on. I will skip the level Cave and touch briefly on the Cavern. In the Cavern I pick up an item called "The Scimitar of Rasha". It is one of the 5 Boss items that can be used to aid me in boss battles. I pick up this item specifically to help me fight the boss Chimera. I'll explain more when we get there. For now let's head the first boss of this game; The Dragon. The Dragon is the easiest boss to fight. I use an amulet, rapid fire, and 5 way shot to maximize my damage. I use theses items for most boss battles. The key to all boss battles is the position of the character. If placed in the correct spot the boss cannot use most of their attacks. For this battle my positioning was very good. Only getting hit once is the best I've ever done. I was very happy with this boss battle. The Castle realm went really well. Each level was played decently with few errors. Not much happens in this realm so I will move forward to the second boss battle, The Chimera. Another easy boss with the help of the boss item. Now there are a couple reasons why I pick up this item. One being it takes out the lions head which makes the boss easier to kill. Also I pick it up to trigger the boss. You see without the item the boss sits in a higher elevation to start. I would need to move in to trigger the boss down which would take time. That coupled with the damage convinces me that getting that boss item is worthwhile. I get the dialog skip and head to the Town Realm. At the start of the Town Realm the levels become progressively longer. This makes things a bit more difficult for me. I can only buy 60 seconds worth of extra speed every time I shop. From this point on I have to be more conservative with it. The worst level in this realm is the Spire. Not only is there a lot of back tracking in that level to get the runestone but the extra speed I pick up is at the end of the level. This is quite frustrating but I get through it will little fault and head toward the boss; the Plague. The Plague is by far the worst boss of this game. Even worse than either of the Skorne battles. It is very tough to predict what moves the Plague will do and some of his moves will take half my health. Luckily I position myself correctly and he posed little threat to me in this run. With his shard recovered I move onto the Ice World. Let me say that I'm not a fan of this realm. The levels are long so it is difficult to maintain my extra speed through each level. Needless to say I get a bit sloppy with that as I progress through. This realm could have been performed better. The Yeti was easier then I expected. I positioned myself in a way where most of his short range attacks did not hurt me. The biggest problem with this boss is if I let his breath hit me it pushes my character back and creates more problems for me. Overall I was very happy with this boss fight. With all the shards gathered I head to the Desecrated Temple. There I head into the first battle with Skorne. In this battle I use an item called Reflective Shield. I use this item to deal with the acid and electric balls that Skorne throws. Overall this battle went well. I took some damage that could have been avoided. Once Skorne is defeated I pick up one of the 4 items he drops. He drops 2 amulets and 2 breath items. I only need the one amulet so I pick that up and head to the final realm; The Battlefield. At this point the rest of the run is fairly simple. Get through 3 levels, grab the last rune stone, and head to the underworld. The underworld in my opinion was very sloppy. I missed a switch that I had to go back for. This could've been better. After the Underworld I head to my second and final battle with Skone. This battle is not my best battle with Skorne. I got hit a few times that were unnecessary. My position was good though so the battle didn't take long. For those who know of my first run on SDA will notice something different. The game doesn't freeze at the end. I'm not too sure why that happens but I can say this: In my first run I would turn the item Time Stop on and off before heading into the second Skorne battle. I think because I did that it created a freeze in the game. I'm not sure how it works but this is my best guess of what happened. Its nice for the ending to be seen now and I'm glad for that. I know this run can be better. There are a few theories I have that could tighten this run up. This run however is a big improvement from the first. At this point I want to thank a few people who have helped me to get to where I am now. Dan and Audrey H. For being my rock, through good and bad, thank you for everything you do. Xatmamune- For showing me that people still play this game and play it well. Thank you for all your help making this run possible. My followers on Twitch- Though you were not there when I recorded this run you were with me in spirit. Thank you! The SDA Community for accepting my first run, and your enduring patience throughout. I wish I could have been better for you. I want to thank you, the viewer, for taking the time to watch this video. This video shows that anyone with the passion and drive to do something can do it. Never give up on your dreams viewer, Never!